Where have all the polka dots gone? Looking over my collection of vintage pictures and catalogs polka dot dresses, tops, and swimsuits were all very popular from the 1920s to the 1960s. Large and small dots white dots on a colored background were plentiful in the mid-century. Black and white polka dots, red and black polka dots, and blue and white polka dot dresses were also very common. Around the world, polka dot prints are also called ditsy, spotty or dotty prints. Vintage polka dot dresses were fun, youthful, trendy and sometimes high fashion. Polka dots can’t help but make women smile which is why I think they were trendy during difficult times. Today’s photo roundup is a salute to vintage polka dot dresses and clothing! The first picture I have is from around 1910. The lady in the middle is wearing a small polka dot walking dress with white piping for trim. This is very unusual for this time period, but it goes to show you that the polka dot dress fad was coming soon. 1927 Polka Dot Dress Fabrics in Silk- for semi formal dresses. In the early 1920’s polka dots captured the youth driven look fashion was founded on. They were especially popular as house dresses and even garden dresses if the dots were small and set against a white background (1922 picture above.) By the mid to late 1920s the polka dot dress left the house and became a staple pattern for semi formal afternoon dresses. Polka dot print fabric never crossed into evening wear but beaded dot patterns were certainly a common design element on Art Deco/ geometric inspired designs. Most polka dots prints remained with sportier looks such as on blouses, skirts, and pajamas. 1929 polka dot party dress is almost 60s mod! I love these cute 1920s drop waist dresses with mixed polka dots! The beach outfit appears to be in two colors over white. I wonder what colors they were? Myrna Loy in When Ladies Meet (1933) sporting a more casual dress with polka dot trim. Polka dot dresses in the 1930s were even more popular than in the 1920s. They also moved away from being just the main dress print to a pretty trim. Still casual and playful they became more sophisticated as all 1930s fashion did- especially when worn by Hollywood’s bright young stars! Polka dots were not just for dresses. They made a great print for beach pajamas too. Mary Pickford’s outfit above looks more like a beach pajama overall or jumper. Just like in the previous decades’ polka dots dresses were a mostly casual day or afternoon dresses. That all was beginning to change after the war. 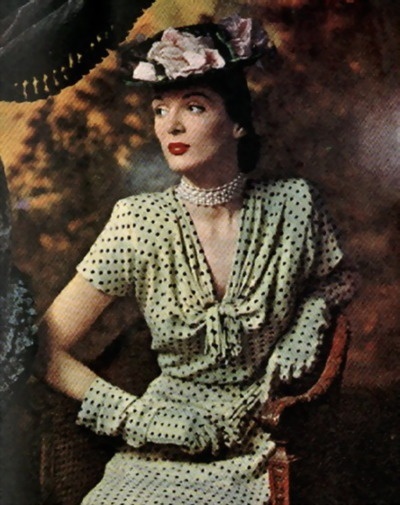 Going into the 1950s polka dots were seen as elegant when matched with accessories: gloves, hats, purses, and even shoes. Polka dot swimsuits were not new to the 1940s but they certainly were cute! I just love this one that Jeanne Crain is modeling. Lucky for us, 1940s retro polka dot dresses are extremely popular with designers and shoppers alike. The “Madden” dress at continues to be a best seller year after year. I love the 1940s silhouette of this dress. 1950s Polka dot lined jacket, umbrella, hat and dress. Everything in the 1950s got big! Big dresses, big skirts, big accessories, and big personalities. Polka dot patterns grew big too. Extra large polka dot prints came on dresses and matching accessories and were at once the biggest fashion statement of the decade. Everything had polka dots. Women of all ages wore them too. They were no longer just for the young women’s population. An explosion of polka dots naturally continued onto sportswear. Tops and bottom both featured prints (although not worn at the same time.) Crop pants were often rolled so the hem showed a polka dot lining. Tops could be all dots or only the cuffs and collars. Colored socks, hair scarves, and jewelry came in polka dots too. It was a time when polka dots accessorized everything. The 1960s had two looks that each adopted polka dots. The first was the return to the school girl style. Polka dot prints appeared on baby doll dresses trimmed with white collars and ruffled lines. It was a similar response that the 1920s had on their young girls look. Thoroughly enjoyed your polka dot photos! Promptly searched online, and found out that polka dot fabric is still widely available – for those who sew, or have someone to sew for them.